DUCATI has announced a new machine to slot into its range between the upright Monsters and race-inspired Panigale – the new SuperSport and SuperSport S.
Claimed to be comfortable on the freeway, agile in the twisties and suitable for city riding, the new machine will arrive in Australia next March. Powered by a 937cc Testastretta liquid-cooled V-twin with 113 horsepower and a flat torque curve, the new machine should be very capable without being a rip-your-arms out road burner. It will feature three riding modes – sport, touring, urban – which points to its design brief – it’s not a race bike, that’s still the Panigale’s job. 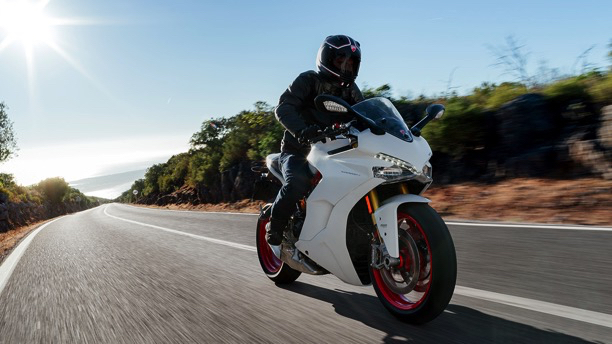 With ‘relaxed’ riding positions for both rider and pillion, good wind protection from the height-adjustable screen and a 16-litre tank to provide range in excess of 200km, don’t be surprised if the Ducati SuperSport quickly becomes on the marque’s best-sellers. The SuperSport range includes a SuperSport S version featuring fully adjustable Öhlins suspension, the Ducati Quick Shift up/down system and a rear seat cover: the latter are also available as accessories for the SuperSport.